Valaste may well be the most attractive thing to ever come out of a drainage ditch. It was born two hundred years ago, with a plan to drain the fields of a manor house in northeastern Estonia. A large ditch, seven kilometres in length, was dug to carry water from the fields to the edge of the Baltic Klint, the limestone cliff that runs all the way from Russia to Sweden beside and beneath the Baltic Sea. Where the ditch meets the cliff, it has formed the highest waterfall in the Baltic states. During the rainy season, water can fall as far as 30 metres to the gorge below (the height varies, depending how much talus has gathered). ... down to the viewing platform. 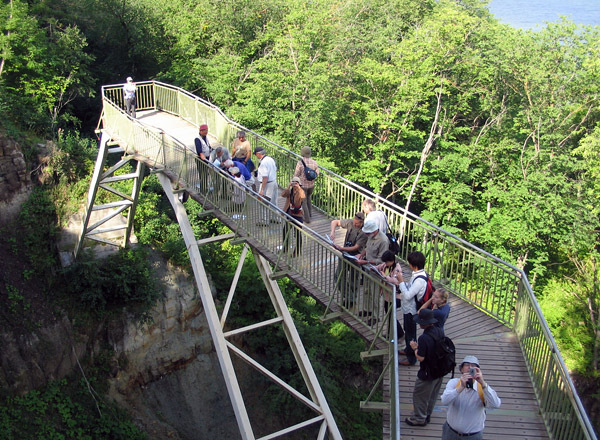 Since scenic beauty spots are rare in northeastern Estonia, the authorities capitalized on this unlikely place by building a viewing platform in the 1990s. This is not only a boon to tourism; it is also a great kindness to geologists. Our group visited on an August morning, trooping down from the parking lot above. In this dry weather there was almost no water flowing, but this permitted us to view an even more exciting outcome of the drainage project: it has cleaned and scoured the cliff wall, exposing a spectacular succession of Cambrian and Ordovician sedimentary rocks. Walking along the catwalk, the foreign visitor is struck by the large number of padlocks attached to the railing. Why are these here? 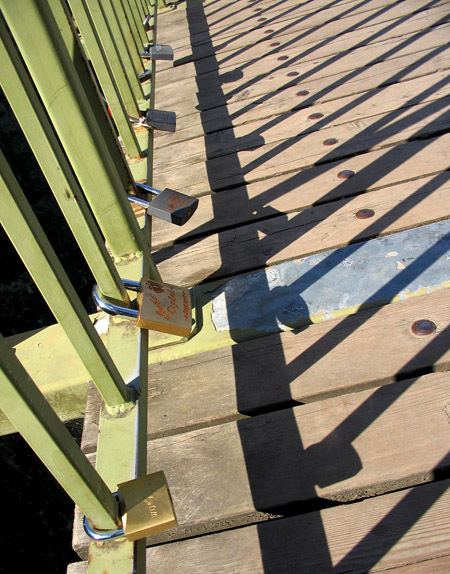 Looking more closely, you realize that every padlock has words etched on it. Most of these are in Russian, and they are the names of courting couples or lovers (much of this end of Estonia is inhabited by ethnic Russians). 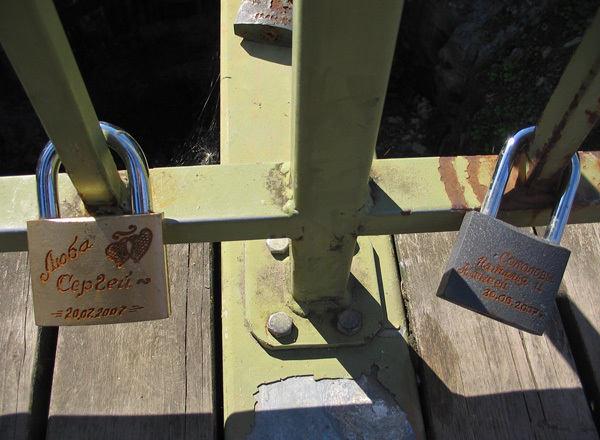 Apparently it is a local habit for couples to have their names etched onto a padlock. 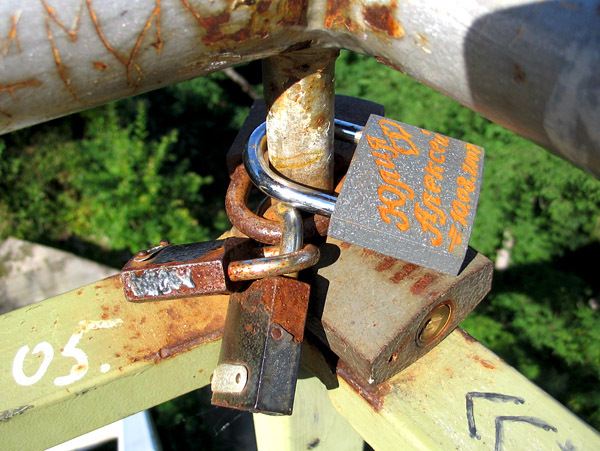 They then lock it onto the railing, and throw the key into the abyss to symbolize their love. My question is: what happens if the relationship falls apart? Does one of them just go in at night with a hacksaw and cut away the padlock, or are they required to jump over the rail and retrieve the key? Unfortunately it is not possible to get close to the cliff here, not without some serious climbing gear. We had to content ourselves with a broad and very general overview of the colourful geology on this, our first morning in Estonia. 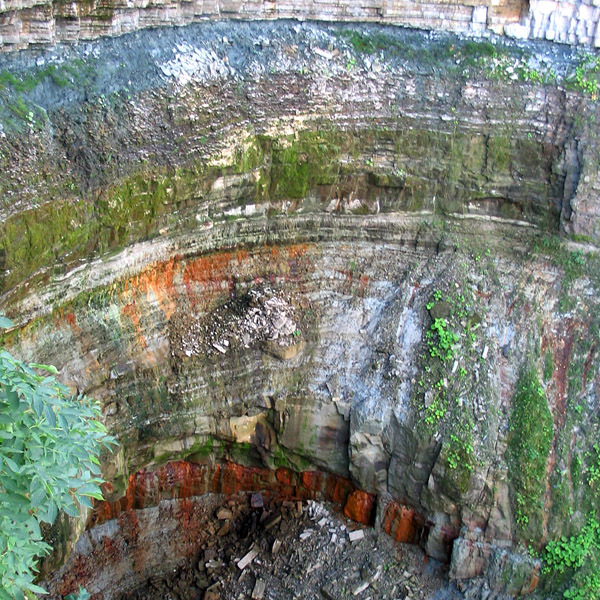 There would be many interesting sites to visit in the coming week of touring quarries and shorelines, so we would not experience any shortage of rocks and fossils during this trip! Right now, there was time to breathe the cool Baltic air after a week of St. Petersburg smog, and, perhaps, time to contemplate local customs. 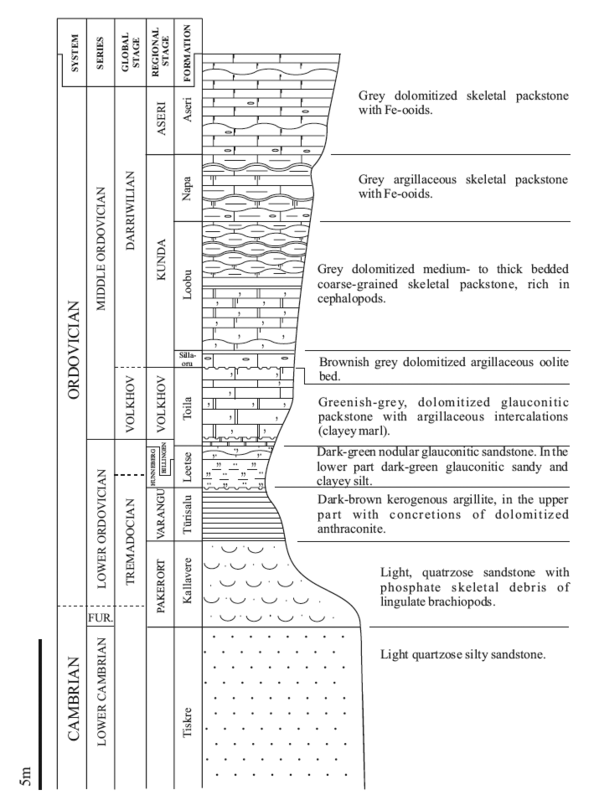 Note (added March 9): I have corrected the explanation of unit colours with the kind help of my friend Helje Pärnaste in Tallinn, who also tells me that, “﻿You have been lucky to see that view to such condensed section from Lower Cambrian to the Mid-Darriwilian. These stairs and the platform are closed now, and perhaps for ever. It became too unstable during eleven years because of its wet sandy base, and there is not now money for restoration.” This is sad; it is such a splendid spot. I also thank Olle Hints and Mari-Ann ﻿Mõtus for doing such a wonderful job of leading our field excursion in 2007. Mõtus, Mari-Ann and Hints, Olle (eds.). 2007. Excursion B2: Lower Paleozoic geology and corals of Estonia. 10th International Symposium on Fossil Cnidaria and Porifera. 64 p.
Tinn, O. Stop 10, Valaste Waterfall, p. 137-138. WOGOGOB-2004, 8th Meeting on the Working group on the Ordovician Geology of Baltoscandia. May 13-18, 2004, Tallinn and Tartu, Estonia. Not all waterfalls on the Baltic Klint were dry when we were in Estonia. This is a photo composite of Jägala Juga, the highest natural waterfall in the region. Can’t quite make it out from the wonderful images, Graham, but is that staircase in the form of a double helix? 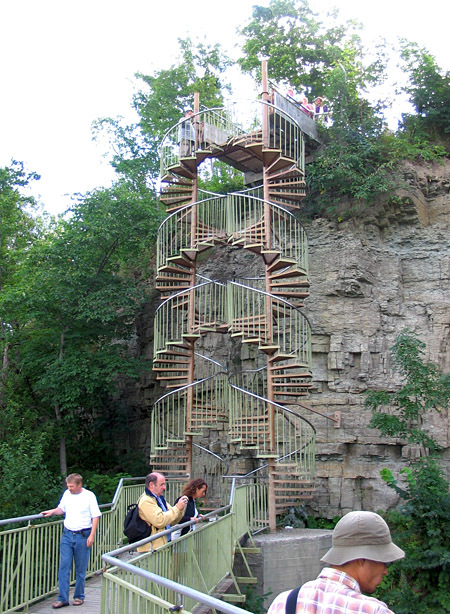 Dave, a double helix staircase would be very cool! No, these aren’t a double helix, but I think that they are mirror-image spirals, so would that make them enantiomeric helices?